Choose a category below, or feel free to contact us! To create a new course, go to your Account Dashboard by clicking on the Gradescope logo in the top left corner of the screen, and click Create Course in the action bar at the bottom. From here, you can fill out your course information. Note that this will not change settings in any existing courses. Any user who is an instructor of any course, including our demo “Gradescope 101” course, can create new courses. Who can see my course? There is no course search functionality on Gradescope, and your course is not exposed to any search engine. Only those who have been explicitly added to the course will be able to see it. Our help item on the course roster has more information on adding users to a course. To change coursewide settings, navigate to the course you wish to modify and click on Course Settings in the left sidebar. If you make any changes, be sure to click Update Course before navigating away from the page. On the Course Settings page, you have the option to select grading defaults, which include the default scoring scheme (positive or negative scoring) and default score bounds (maximum and mimimum possible score). These default settings will apply to all new assignments that you create within the course. You can also delete the course on this page. Note that you cannot currently delete a course if any student submissions have been uploaded. Delete all assignments first, or email us if you’d like to delete a course in this situation. Canvas, Blackboard, Brightspace, Sakai, and Moodle integrations are available with an institutional license. To learn more about how to get LMS integration for your school, email sales@gradescope.com. (These instructions are for Canvas, but they apply to Blackboard, Brightspace, Sakai, and Moodle as well.) If your school has Canvas integration enabled, you will first need to link your Gradescope course to the corresponding Canvas course. From the course dashboard, go to Course Settings in the left sidebar, scroll down to the Canvas Course section, and click Link. The first time you do this, you will be taken to the Canvas website, where you can log in to your Canvas account. After you log in, click Authorize to authorize Gradescope to save your Canvas credentials. If you ever want to un-link your Canvas account, you can do so by going to your Edit Account page, scrolling down to Linked Accounts, and clicking the Remove button next to the Canvas account. Once you’re back to the Link Canvas Course dialog, select your Canvas course from the dropdown menu and click Link Course. Your Canvas course is now linked to Gradescope. You can change the link or unlink the course at any time from the Course Settings page. Note that changing the link or unlinking a Canvas course will also unlink any linked assignments or students on the course roster. 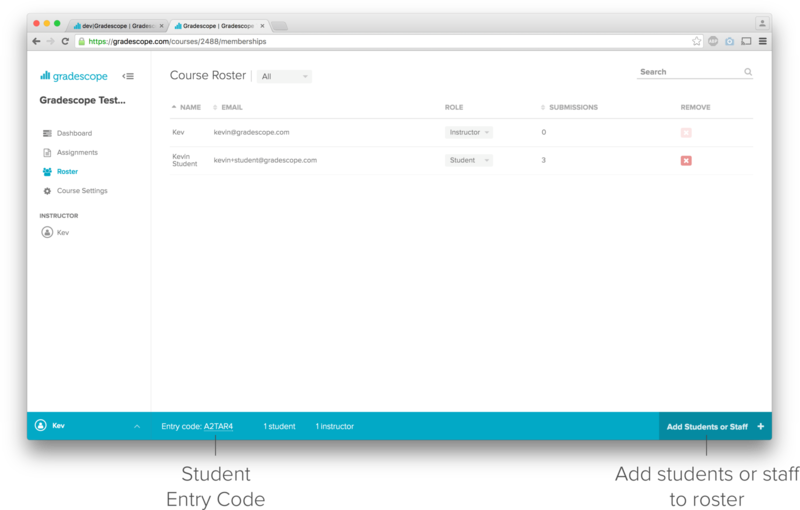 The course roster is necessary to match students to submissions, manage course staff permissions, and allow students to see their work on Gradescope. Gradescope has three staff roles: Instructors, TAs, and Readers. Currently, all three roles have the same permissions when it comes to adding/removing students, uploading, naming, grading, and responding to regrade requests. The only difference between instructors and TAs/Readers right now is that students will see all instructor names, but TA and Reader names are anonymous to students. In the action bar of the Roster page of your course, you can see the course entry code. If you let students know your course’s entry code, they will be able to add themselves to your course (see our help item on how students can add themselves to a course). Note that you can disable the option for students to self-enroll with the entry code from the Course Settings page. To add members to your roster, click on Add Students or Staff in the bottom right hand corner of the Roster page of your course. A dialog will appear allowing you to add a single user or upload a CSV file to add many users at once. We recommend adding your students via a CSV file to speed up this process. Gradescope accounts will automatically be created for any members you add to your roster who do not yet have accounts. 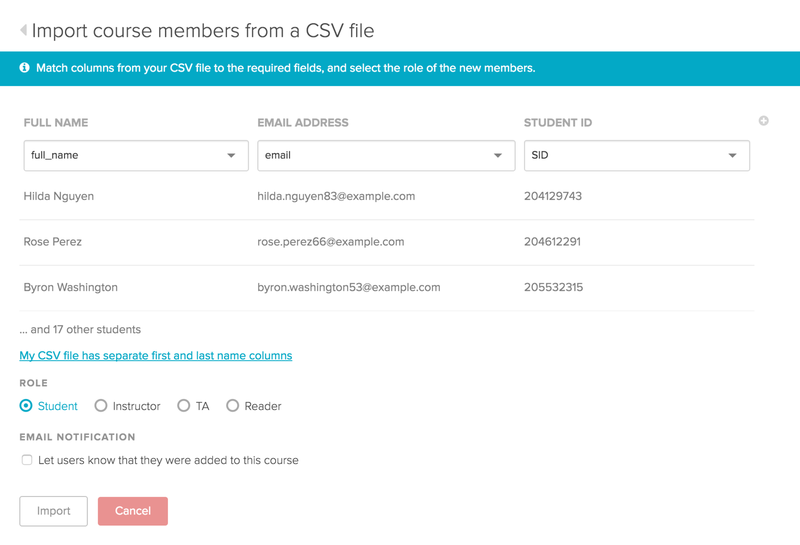 Make sure your roster CSV has column headers and uses unique email addresses for each student. Once you have uploaded the CSV, you will be asked to match the columns of your CSV with Gradescope fields. If a column shows up as blank, click on the drop down menu to select the corresponding Gradescope field. If your CSV has separate columns for student first names and student last names, click My CSV file has separate first and last name columns. Note that having separate columns for first and last names will make it possible to sort your roster alphabetically by last name. You can include extra columns such as Section Number: just press the button on the right of the column names and select the relevant column. Note that we currently don’t display information from the extra columns on the Course Roster page, but we do include it in all spreadsheet downloads. You can also view this information for any student by hovering over their name and clicking on Edit Student. If you add a Section column to your roster, you’ll have the option to grade one section at a time in your Gradescope assignments. Lastly, you can choose to send an email notification to the users being added. Generally, if your first Gradescope assignment will be instructor-submitted, like an exam or quiz, you shouldn’t send this notification when adding students. They won’t be able to do anything, and you can notify them via email when their first assignment is fully graded. If your first Gradescope assignment will be student-submitted, you should notify students when adding them, so that they can log in and submit their work. To make any modifications to the roster, you can click on the Edit Student button next to the student’s name that you wish to edit. Note that you can only edit a student’s email address if they have never logged into their account. Email us if you would like to update the email address for a student who has already logged in. If your roster has separate columns for first and last names, you can alphabetize students by last name by using the Swap button at the top of the name column. You can also upload a new CSV file to update your roster in bulk; email addresses will be used to match rows in the file to existing students. You can view a history of all grades in your course for any student by clicking on the student’s name in the course roster. From here, you can also quickly jump to all assignment submissions for that student. (These instructions are for Canvas, but they apply to Blackboard, Brightspace, Sakai, and Moodle as well.) If your school has Canvas integration enabled, click Sync Canvas Roster in the bottom action bar of the Roster page. If you want to send students and course staff an email notification that they were added to the course, check the “Let users know that they were added to this course” box. Then, click Sync Roster. Your students’ and course staff’s names and emails will be synced to the Gradescope roster from Canvas. Note that Observers will not be synced. If a icon appears in the Linked column on your Roster page, the user was successfully linked to a user on your Canvas roster. 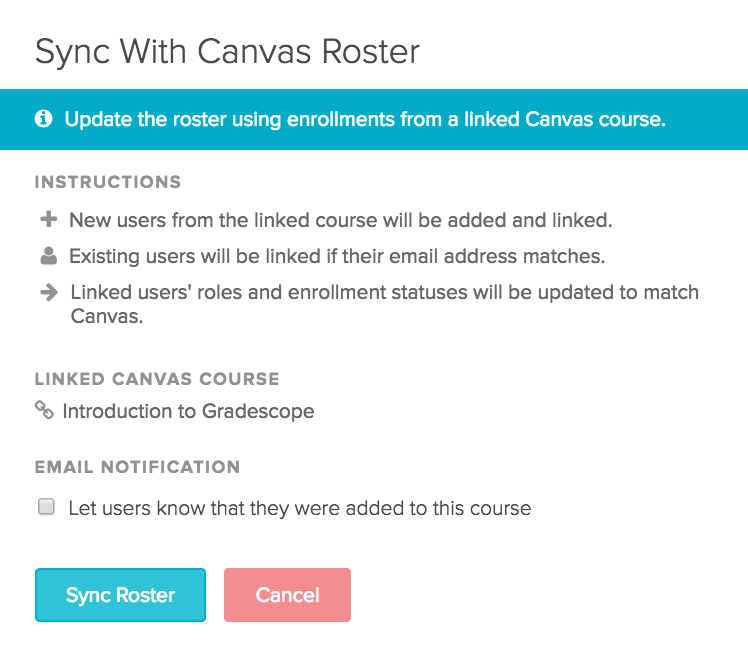 Every time your Canvas roster changes, you will need to click the Sync Canvas Roster button in order to see the changes in Gradescope. To create a new assignment, click Create Assignment in the bottom right corner of your course’s Assignments page. The template PDF should be a blank version of your test, or instructions such as a list of assigned homework problems. This PDF is used in further steps of Gradescope such as Creating an Outline. Note that students will not have access to this file—you must distribute it yourself if you want students to have it. Instructor if course staff will collect, scan, and upload student work. Student if students will upload their own work. This type of assignment is usually a quiz or exam and will require scanning by the course staff. NOTE: Here’s the sample template used in the video. For student-uploaded work, there are a few extra options to set. The Release Date specifies the date and time when students will become able to submit their work. The Due Date specifies when students will stop being able to submit their work without any late penalties. The Late Due Date specifies the last date when students will be able to submit their work on Gradescope. Submissions uploaded between the due date and late due date will be marked ‘late’ on the Review Grades page and in the grading interface. NOTE: If you do not want students to be able to upload late submissions, you can uncheck the “Allow late submissions” box. Instructors can also upload submissions for students after the deadline from the Manage Submissions page. The submission type has to do with what format you expect students to upload their work in. Choose PDF with fixed template if you know where students will write their answers (exams, worksheets). Choose PDF or images (one or more pages per question) if your assignment is flexible—for example, a list of textbook problems. With PDF submissions, students will specify which page corresponds to which problem at upload time. If Group Submissions are enabled, students will be able to add group members to their submission. You can set a limit for the maximum number of students that can be in a group. Students can add or edit group members at any time (even after the deadline), but you will always be able to see everyone’s full submission history. You can also add or delete group members by clicking on the submission from the Manage Submissions page and clicking the Group Members button in the bottom action bar. You can view all of your currently active assignments from the Course Dashboard. Assignments remain active unless they have been published, have no pending regrade requests, and have not been updated in a week. You can access all of your assignments (both active and inactive) from the Assignments tab in the left sidebar. If you ever wish to change any of these settings, you can access them by clicking on the assignment name and going to Settings in the left sidebar. On the Assignment Settings page, you also have the option to set assignment-wide grading defaults, which include the default scoring scheme (positive or negative scoring) and default score bounds (maximum and minimum possible score). If you’d like these default settings to apply to all existing questions, check the “Apply these settings to all questions” box. Deleting an assignment is possible from the Settings page. Upon clicking the Delete Assignment button, you will be prompted to confirm your action. If you delete an assignment, the template, outline, and all associated submissions will be deleted as well. (These instructions are for Canvas, but they apply to Blackboard, Brightspace, Sakai, and Moodle as well.) If your school has Canvas integration enabled, you can link a corresponding Canvas assignment to your Gradescope assignment in order to export grades back to Canvas. To link a Canvas assignment, click into your Gradescope assignment and go to Settings in the left sidebar. Scroll down to the Canvas Assignment section and click Link. Then, select the matching Canvas assignment from the dropdown menu and click Link Assignment. Note that, if you delete and recreate the assignment, you’ll need to re-link it to Canvas. Assignments can be duplicated, with the template, question outline, and all question rubrics copied. To duplicate an assignment, navigate to the Assignments page of the course where you want the new assignment to be created. Click on Duplicate Assignment in the action bar to bring up the assignment duplication dialog. You will then see a list of your courses. If you click into one, you will find the list of the assignments for that course. Select the assignment you want to duplicate, and enter the title of the new assignment. Note that you can’t have two assignments with the same name within the same course. To download all the assignment grades as a spreadsheet, navigate to the Assignments page, and click the button in the bottom action bar titled Download Grades. All assignment grades and roster information (including extra columns) will be included in this spreadsheet. Gradescope allows you to grade paper-based exams, quizzes, and homework. In addition, Gradescope enables you to automatically or manually grade programming assignments. 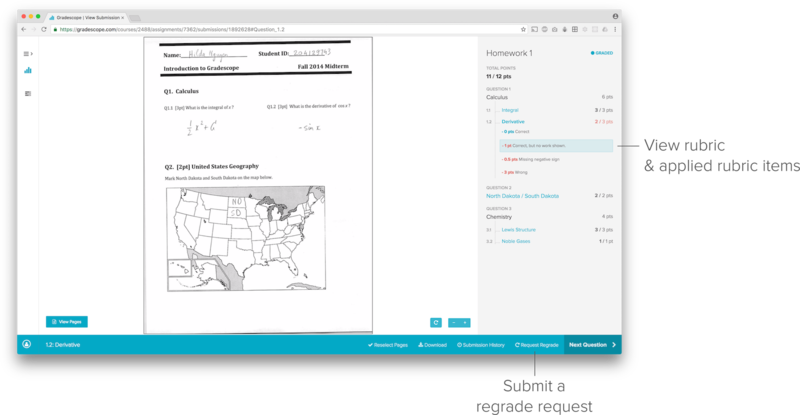 For paper assignments, Gradescope works well for many types of questions: paragraphs, proofs, diagrams, fill-in-the-blank, true/false, and more. Our biggest users so far have been high school and higher-ed courses in Math, Chemistry, Computer Science, Physics, Economics, and Business — but we’re confident that our tool is useful to most subject areas and grade levels. Please reach out to us and we can help you figure out if Gradescope will be helpful in your course. To grade exams or quizzes you will start by creating the assignment. For the option of “Who will upload submissions”, choosing Instructor will allow the instructor(s) to upload student work (Creating, editing, and deleting an assignment). Once the assignment is created, you’ll mark the question regions on a template PDF (Creating an outline), upload and process scans (Managing scans), match student names to submissions (Managing submissions), and grade student work with flexible, dynamic rubrics (Grading). 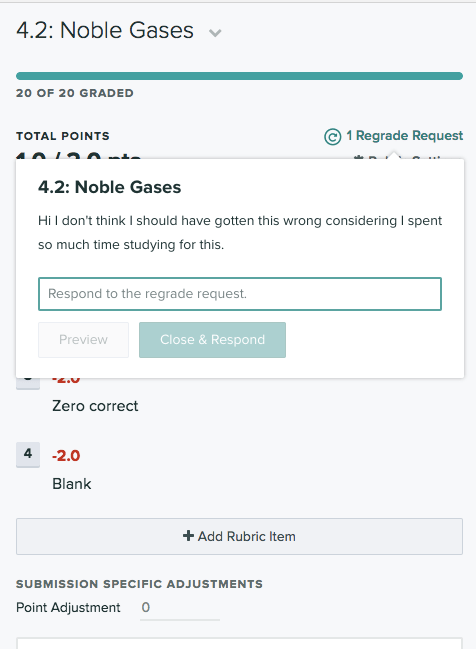 When grading is finished you can publish grades and email students (Reviewing grades) as well as export grades (Exporting Grades) and manage regrade requests (Managing regrade requests). 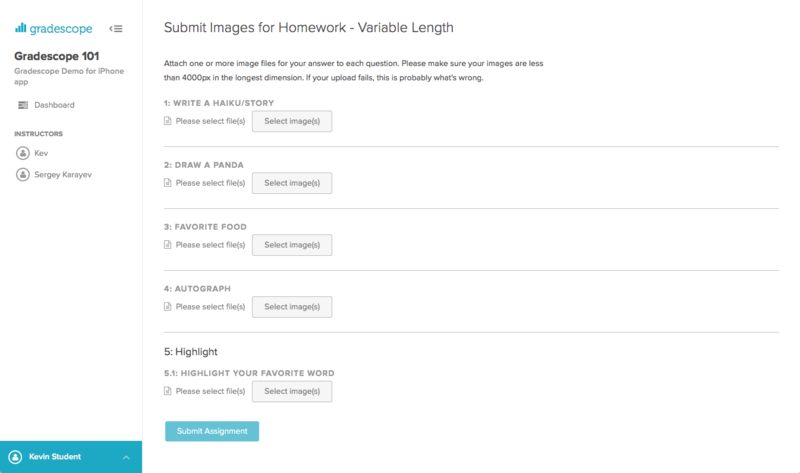 Homework has an even simpler workflow because students will mark where their answers are on their submissions (Submitting an assignment). You start by creating a “Student” uploaded assignment rather than an instructor-submitted one. For student-uploaded assignments there are a few more options, such as release date, due date, and group submission policy (Creating, editing, and deleting an assignment). Next, you will create the assignment outline (Creating an outline) and wait for students to submit their work. You can begin grading as soon as a single submission is uploaded, and you can view all student-uploaded submissions from the Manage Submissions tab. The rest of the workflow is the same as Exams & Quizzes: you can publish grades, email students (Reviewing grades), export grades (Exporting Grades), and manage regrade requests (Managing regrade requests). Programming assignments are available with institutional site licenses and for individual courses subscribed to Gradescope Complete. If you have any questions about getting access in your course, or want to experiment with the platform, please send us an email. 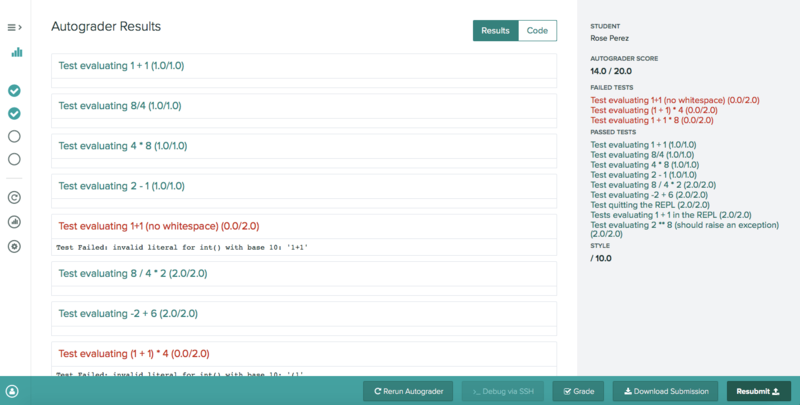 Autograding: With our autograder platform, you have full flexibility in setting up whatever language, compilers, libraries or other dependencies you need. You provide us with a setup script and an autograder script, along with whatever supporting code you need, and we manage accepting student submissions, running your autograder at scale, and distributing the results back to students and to you. 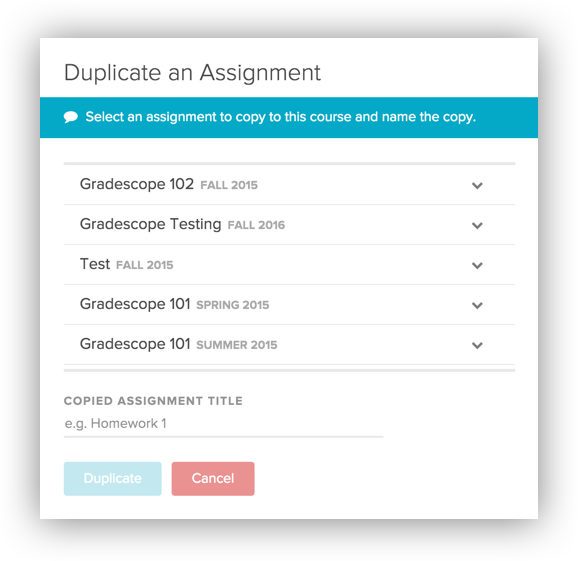 As an instructor, you can create a new programming assignment on Gradescope and upload your autograder zip file following our specifications. Your code produces output in the format that we request. Students submit to Gradescope and have their work evaluated on demand. They can submit as many times as they want and get results back as soon as the autograder finishes running. At the end of the process, you can download their code and their results. If you want to learn more about setting up programming assignments, check out the Gradescope Autograder Documentation. Manual Grading: You can also grade students’ code manually using the Gradescope grading interface. To enable manual grading, check the “Enable Manual Grading” box when creating a programming assignment. You can also enable this on the settings page for an existing assignment. 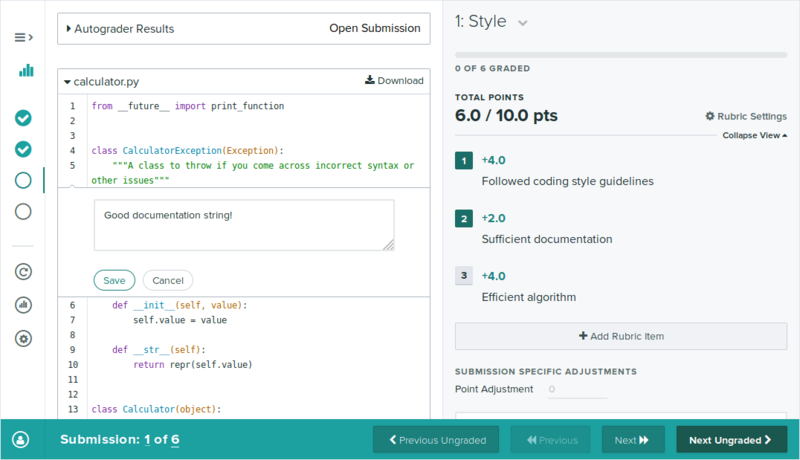 Your students can then upload their code, and you can grade it from the Grade Submissions tab, using a rubric and in-line comments. If manual grading is enabled for a programming assignment, you can indicate one or more manually graded questions on the assignment’s Edit Outline page. You can also have both autograded and manually graded components on one programming assignment. Bubble sheet assignments allow you to pre-define the correct answers for questions on multiple choice exams. If you use the Gradescope bubble sheet template, you can mark the correct answers for each question ahead of time, and Gradescope will automatically grade all student submissions for you. The current template supports up to 60 questions, but if your assignment has more, please email us, and we can send you a longer template. Bubble sheet assignments are available with institutional site licenses and for individual courses subscribed to Gradescope Complete. If you have any questions about getting access in your course, please send us an email. To create a bubble sheet assignment, go to the Assignments page and click Create Bubble Sheet Assignment in the bottom action bar. Give the assignment a title and select whether instructors or students will be uploading submissions. You will then be taken to the Answer Key page. On the Answer Key page, indicate the correct answer for each question on your exam. If you select multiple bubbles for a question, students will only get full credit if they select all of the correct bubbles. You can indicate the number of points each question is worth at the top of the page. If you want any questions to have a different maximum point value than the default, you can set a custom point value by clicking the icon next to the question number. Any questions you leave blank will not be graded. Once you are done with the answer key, you can upload the submission scans (Managing scans) and match them to students (Managing submissions). Make sure that all of the submissions follow our bubble sheet template. We will start processing and grading the submissions as soon as they’re uploaded. This may take a few minutes. If some submissions are not graded, that is because our AI was not confident enough in the student answer. 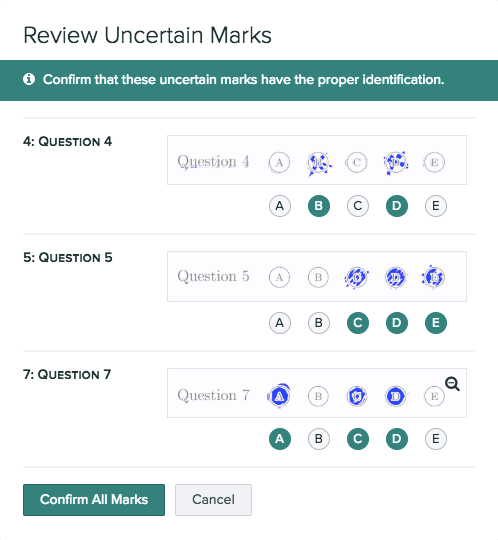 To review uncertain marks, click Uncertain Marks at the top of the Grade Submissions page or next to each question. You’ll see an image of the student’s answer and Gradescope’s proposed identification. If any of the suggestions are incorrect, click the correct bubbles. Click Confirm All Marks to grade all the submissions with uncertain marks. If you’d like to award partial credit to certain answer options, give more detailed feedback for each option, or adjust the rubric in any way, you can do so by clicking on the question name on the Grade Submissions page. Any changes you make to the rubric for a given question will apply to all students who have that rubric item applied. Once all submissions are graded, you can publish the assignment to students (Reviewing grades). You can go to the Statistics page to see a breakdown of scores and selected answers for each question. We also have an Item Analysis feature in beta (accessible from the Statistics page), which will let you see the discriminatory scores for each question. 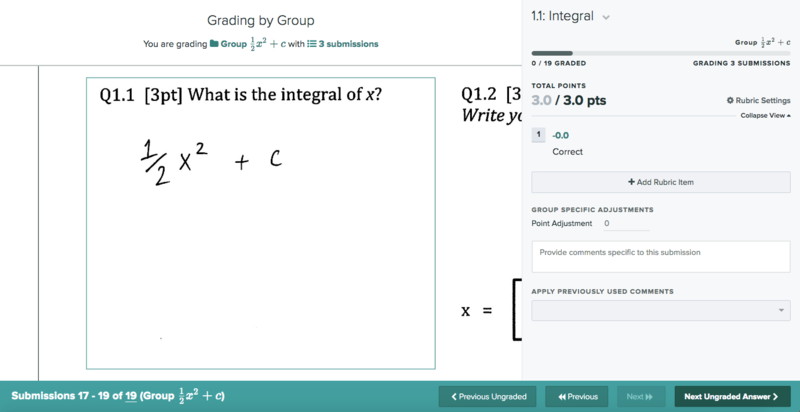 Online assignments let you create questions directly on Gradescope. Students will be able to log in and submit responses within the Gradescope interface. For some types of questions (multiple choice, select all, and fill-in-the-blank), you can also indicate the correct answer ahead of time, and student submissions will be automatically graded. This feature is currently in beta. If you’d like to try it out, please send us an email. Once the feature is out of beta, online assignments will be available with institutional site licenses and for individual courses subscribed to Gradescope Complete. To create an online assignment, go to the Assignments page for your course. Click Create Assignment. Skip uploading the template file, name the assignment, and choose “Student” for “Who Will Upload Submissions?”. Then, select “Online Submission” for the submission type and set a release date, due date, and (optionally) late due date. Click Next to continue to the assignment editor. NOTE: If you’re making a test assignment that students should not see, make sure to set the Release Date far in the future, or use a demo course that has no real students in it. You’ll now see the Assignment Editor. 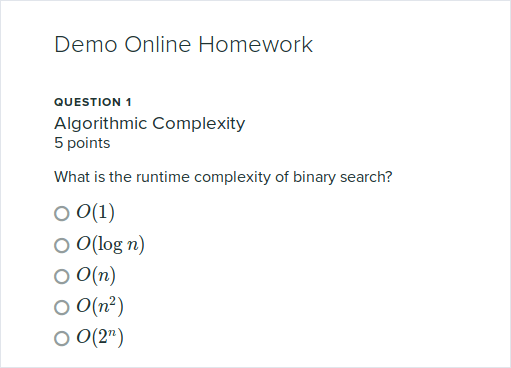 For each question, you can enter a title and the point value. You can enter the question description in the “Problem” field. Click Insert Field to add fields to your question. We currently support Multiple Choice, Select All, Short Answer, and Free Response fields. For Multiple Choice, Select All, and Short Answer questions, you’ll supply the correct answer, and we’ll automatically grade your students’ responses. 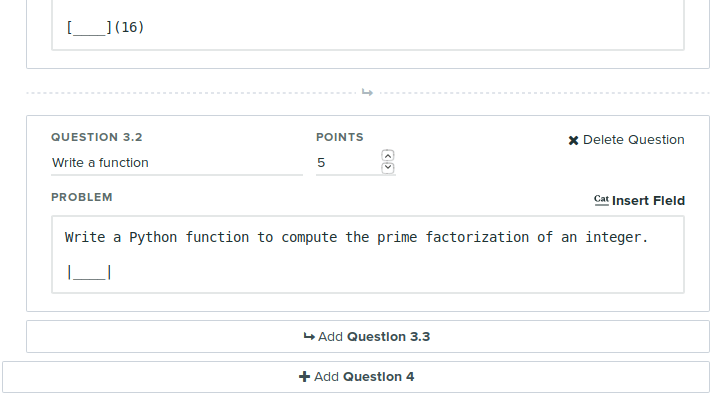 A question can have multiple input fields, in which case the student must get all of them correct to receive credit. Input markup must be the only thing on the line that it occurs on. This means that you currently cannot have text before or after an input field. Make sure to put the answer field on a separate line, with no text before or after it. For short answer questions with numerical answers, you can specify a correct answer like =1+-0.1 to allow students to give any numerical answer within that range (in this example, any answer between 0.9 and 1.1 would be marked as correct). Any normal text you type in the question box will be passed through as text. Markdown and LaTeX expressions are also rendered. (denote LaTeX with $$, eg. $$x^2$$). You can see a preview of what the assignment will look like to students in the pane on the right. You can add an optional explanation for the correct answer, which students will see after the deadline. You can also enable showing the explanation after a student gets the correct answer by going to the assignment’s Settings page and checking the box for Show explanations when students answer a question correctly. To add an explanation to a question, put two square brackets ([[ ]]) around the explanation text. Make sure to put the explanation on a separate line, with no text before or after it. For multiple line explanations, use brackets around each line of the explanation. Empty lines between explanations will break them up into two separate blocks. You can add new questions or subquestions using the Insert Question and Add Subquestion buttons below each question. The dashed line with an icon, when hovered over, turns into an “Insert Question” button, which inserts a question at the spot where the line is (in between two questions). Adding a subquestion turns the question into a question group and adds a child question of the current question. Note that when you make a group of questions, the top-level question can only be used for description text, and students cannot submit any input fields within that question. i.e. If you have questions 1.1, 1.2, and 1.3, students can only submit answers to those, and not to Question 1, the parent of the group. Finally, you can delete questions using the Delete Question button. Deleting all parts of a question group will revert that question group to a regular question (i.e. inputs will work again). 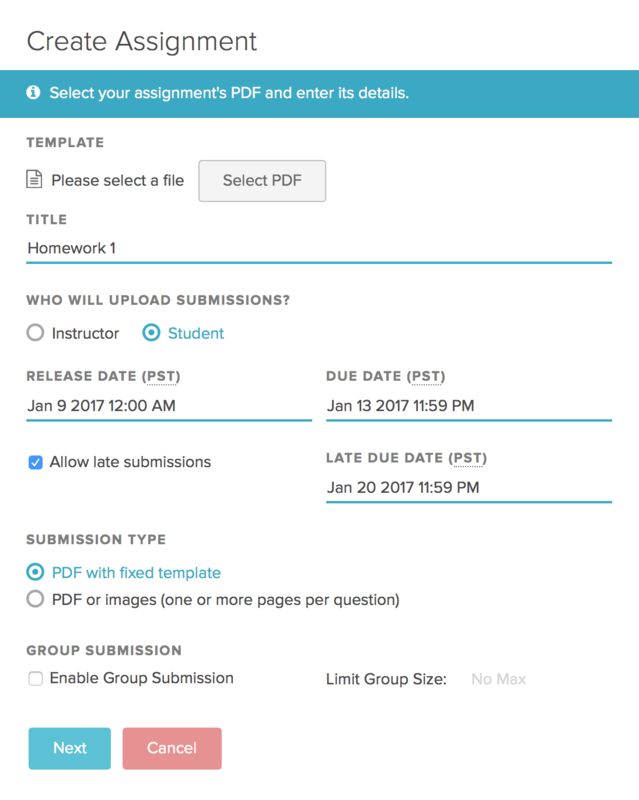 Once you’ve created the assignment, your students will be able to log in and submit their responses within the submission time window. Students can submit answers to each question one at a time, or submit the entire assignment at once. When students log in, they will see a link on their course dashboard to submit an online assignment. If they have already submitted, the link will take them to their submission, and there will be a “Resubmit” button that they can use to resubmit as many times as they’d like before the deadline. You can preview what the student submission interface will look like by going to the assignment’s Manage Submissions page and clicking New Submission. Student submissions for multiple choice, select all, and short answer questions will be graded automatically. Short answer questions require an exact match to be marked correct. You can enable options for making the matching case-insensitive and to remove leading/trailing whitespaces on the assignment’s Settings page. If there are multiple input fields in one question, students must answer all of them correctly to receive any credit. If there are any free response questions, you can grade those manually from the assignment’s Grade Submissions page. Note that students won’t see their feedback and scores until you publish grades. If you intend for students to see their results immediately, you should publish grades when you are finished creating the assignment. Editing an assignment currently leaves any grading on existing submissions alone. If you need scores recomputed, you can click Regrade All Submissions on the assignment’s Manage Submissions page. Creating the Assignment Outline is the first step within the Assignment Workflow. In this step, you create questions and tell Gradescope where each question is located, if it’s a fixed-template assignment. You will see the Template PDF on the left and an empty outline on the right. To start creating an outline click + new question to begin adding questions. You can title your questions and add point values. In addition, you can create subquestions by clicking the teal “add subquestion” icon (to the right of the red “x” delete icon), or by dragging a question into another one. You can also drag a subquestion outward to turn it into a question. You can always remove a question, a subquestion, or a group of subquestions by clicking the red “x” delete icon next to each of these items. You may also replace the template PDF at any time by going to Settings in the left sidebar. Replacing the template will preserve the outline, any region boxes, and any grading you’ve already done for that assignment. If your outline is for a student-submitted, variable-length assignment, then you are done once you list all of your questions/subquestions and assign point values. When your students upload an assignment, they will mark the location of each question on their submissions (Submitting an Assignment). If your outline is for a fixed-length assignment, you will need to set name and question regions on your template. When creating outlines for fixed-length assignments, you can set the regions where students will write their names and student IDs. Creating either a name region or an ID region is necessary for the Manage Submissions step of assigning names to submissions. Having both is optional, but providing both a name and ID region can help increase the number of students that are automatically matched to submissions. Click the Select Name Region button to create a name region which covers the area of the template where students will write their full names. If you’ve already selected the region, the button will say Edit Name Region. You can do the same for student IDs by clicking Create ID Region. For greater submission matching accuracy, make sure your name and ID regions do not overlap. Just like manipulating a question box, you can drag and resize the name and ID boxes over the desired area of the PDF. For fixed-length assignments, you will also need to specify the areas where students will write their answers. You can do this by resizing and dragging question boxes on your Template PDF. You can also create new questions and subquestions by clicking and dragging on the PDF. Note that if you ever replace the template PDF, all of your question regions will be preserved. When grading an assignment, the viewer will automatically zoom to the region you designated. It’s generally helpful to create regions that are slightly larger than the actual area you expect students to use. Manage Scans is only part of the workflow for instructor-submitted assignments. For student-submitted assignments, this page will not appear in the assignment workflow. You can download the two batches used in this video: first and second. Once you have your PDFs ready to upload, click Select PDF Files on the Manage Scans page. Select your files, and they will begin uploading. You can also drag and drop submissions directly onto the Manage Scans page. While you can upload a PDF for each student submission, we recommend uploading PDFs that contain multiple student submissions for faster processing. Once the scans have been uploaded, we’ll process them and attempt to create submissions by matching the uploaded pages to the template PDF (which you uploaded when you first created the assignment). NOTE: To replace the Template PDF, navigate to the Settings for the Assignment. If we’re confident, we will automatically split the scan into submissions, and you’ll see a message that submissions were created automatically. You can click Show to double check that everything was split correctly. If we are not confident about the split, you’ll see a message that says “Ready to Create Submissions”. If you see this message, click Show to view the pages of your PDF and review the proposed splitting of your scans. Be sure to review the recommended splitting to make sure your scans turn into correct submissions. An easy way to check this is to look at the first page of each submission to make sure that it matches the template. If a proposed submission has out of order pages or an extra page, you can drag and reorder pages, as well as set your own split points by hovering over the submission and clicking Split. You can also merge submissions together by clicking Merge With Previous. 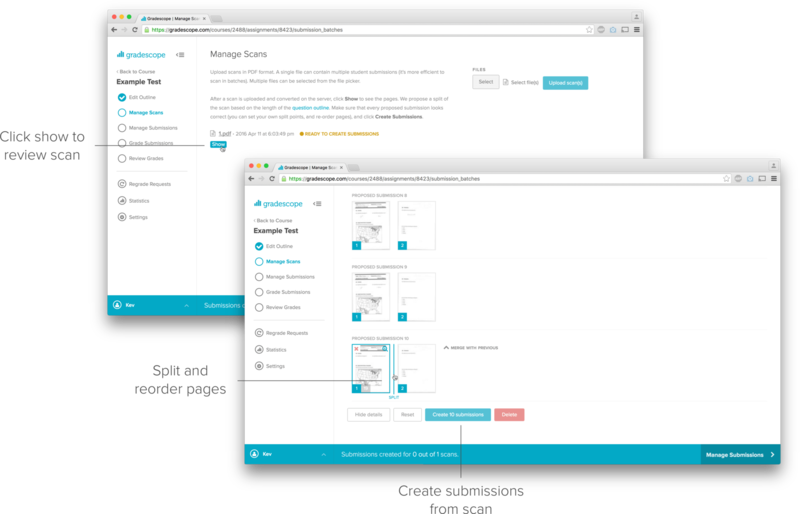 Finally, you can click Rotate Submission to rotate all pages in the submission, or you can rotate individual pages. Once you have reviewed all the proposed submissions, you can confirm the proposals by clicking Create Submissions at the bottom of the page. For instructor-submitted assignments, as soon as submissions are created on the Manage Scans page, we will automatically attempt to match each submission to a student in your roster, using the Name and ID regions that you set up in the Edit Outline step. While we can attempt to match with only one region, using both Name and ID regions will achieve the best results. In the upper left corner of the Manage Submissions page, you can see the total number of submissions and the number of students in your roster who don’t have assigned submissions. You can click on the “Unassigned” tab in the upper right corner to view any submissions that could not be confidently matched. For these submissions, click on Enter Student Name, type in the name or ID of the student (or just a few letters with auto-complete), hit Tab (rather than Enter) to select the user, and repeat until there are no more unassigned submissions. Note that adjusting the location of the name or ID regions on the Edit Outline page will re-run the automatic matching on all submissions. Any manually matched submissions will not be overwritten. If you’d ever like to turn off automatic roster matching and match all students manually, you can do so at the top of the Manage Submissions page. If you would like to replace or delete a specific student’s submission, hover over their name and click Show Details. Replacing a PDF will not delete any grading progress on that submission. If you click on any student’s name from the Manage Submissions page, you can download their submission by clicking Download Original in the bottom action bar. You can also view the student’s submission history, and for variable-length student-uploaded assignments, you can re-select the pages that correspond to each question. If group submission is enabled, you can also add or delete group members from this page. You can also upload a new scanned submission on the Manage Submissions page, by clicking Upload Submission in the bottom action bar. Answer Groups (for all question types): the ability to form and grade answer groups, instead of individual student answers. AI Assistance (for some question types): Gradescope AI automatically forms suggested answer groups for your review. Answer Groups and AI Assistance are available with institutional site licenses and for individual courses subscribed to Gradescope Complete. If you have any questions about getting access in your course, please send us an email. To get started, go to the Grade Submissions tab and click on a question. If you’d like to form answer groups for the question, click Form Answer Groups First. If you’d like to grade each submission individually (skip answer grouping), click Grade Individually. You can also save this setting for all other questions on the assignment by checking the “apply grading method to all other questions” box. The first step in the Answer Groups workflow is selecting the type of question. Four question types are currently supported: Manually Grouped, Multiple Choice, Math Fill-in-the-blank, and Text Fill-in-the-blank. This is suitable for all questions. Gradescope will simply find and group blank submissions for you. You can then manually form your own groups of answers. Questions where students fill in bubbles or check squares. We do not currently support questions of circle-the-right-choice variety. There must be clear mark areas, and they must be clearly selected by the student (no half-filled bubbles). Students should use an ink pen to select the mark areas for maximum clarity. Your uploaded assignment template must be completely blank; do not upload an answer key as your template. When drawing question region boxes on the assignment outline, make sure that each box only covers one question’s mark areas. The size of the question region boxes will not affect the AI’s accuracy. Gradescope will show you the detected mark areas in blue. If the squares are not properly over the answer areas, you can click Edit Mark Regions to adjust them. Please email us if you would like a suggested LaTeX template for formatting your multiple choice questions. Gradescope AI is able to read student handwriting of English-language text and of math notation (including fractions, integral signs, etc.). The main constraint is for the student answer to be on just one line, which is most easily enforced by providing a clear box or underscored area in the assignment template, as in the two examples below. You can adjust the final answer area by clicking Final Answer Area from the question type selection page. Once you select a question type, click on “Set Question Type”. 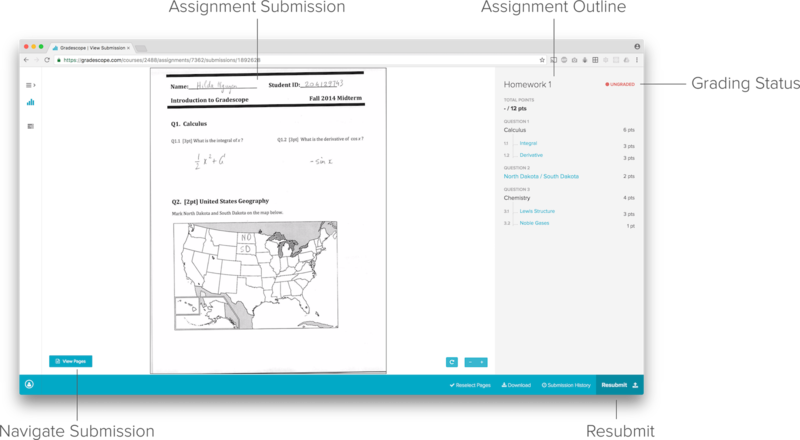 If you selected Multiple Choice, Math Fill-in-the-blank, or Text Fill-in-the-blank as your question type, Gradescope AI will search through your students’ submissions and group them by content. Each group will contain a minimum of two answers. The next step in the Answer Groups workflow is reviewing the suggested groups. Note that, if you edit the question region in the assignment outline, unconfirmed groups will be deleted for that question in the course of re-processing. Confirmed groups will remain. On the Review Groups page, you will see an image of one of the responses within the group, the group name, and how many student submissions are in that group. You can edit the group name or delete the group by hovering over the group with your mouse and clicking the Rename or Delete (and Ungroup Answers) buttons. If there is a specific part of the question region that you would like to group the answers by, you can indicate the answer region by clicking Final Answer Area at the top of the page. Changing the final answer area will reprocess the submissions and update the groups. Click on the image for your first group to review the answers in that group. If all of the answers within the group look the same, click Confirm & Review Next Group in the bottom action bar. If some answer does not belong in the group, click on it, or press the space bar while hovering over it. You can quickly navigate between answers by using the arrow keys on your keyboard. 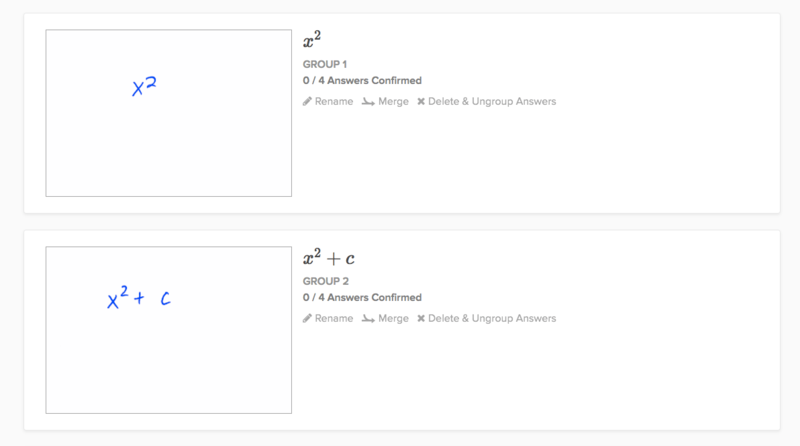 If you find that two or more proposed groups have the same answer, you can click Merge to merge the groups. Select the groups you want to merge and then click Merge Selected in the bottom action bar. Repeat this process until all groups have been reviewed. If you realize you made a mistake, you can go back and re-review a group by clicking View Groups in the bottom action bar, or by using the back button in your browser. 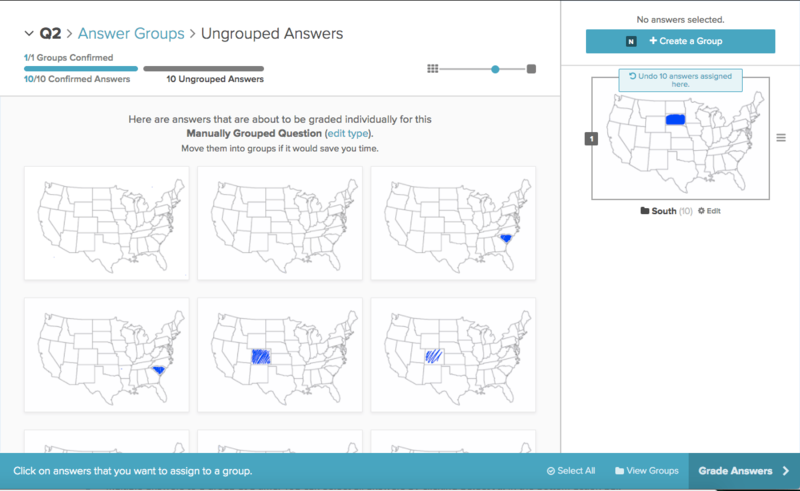 Once you’re done reviewing suggested groups, or if you selected “Manually Grouped” for your question type, you will be taken to the Ungrouped Answers page. You will see the ungrouped answers on the left and a list of the groups (if any) on the right. You can create a new group at any time by clicking Create a Group in the upper right corner. Click on the Edit button below an existing group to delete the group, edit its title, or merge it with another group. You can add ungrouped answers to a group by clicking and dragging, or by clicking on each answer and then clicking on the group. Note that you may add multiple answers to a group at a time. You can select all answers by clicking Select All in the bottom action bar. You can also use keyboard shortcuts to speed up the process of manually grouping answers. Use the N key to create a new group. Use the arrow keys to jump between ungrouped answers. Use the space bar to select or deselect an answer. Use the number key on your keyboard that corresponds to the group number to assign the answer(s) to an existing group. When you’re done grouping, click Grade Answers in the bottom action bar. Feel free to leave some answers ungrouped: you will grade ungrouped answers individually, after you have graded all of the groups. The grading interface for grading by group is very similar to the regular grading interface, which our Grading section explains below. In this section, we explain the differences that Group Grading introduces. On the left side of the grading interface, you will see the name of your group, the number of submissions in that group, and one sample submission. On the right side of the grading interface, you’ll see the progress bar and your rubric. If you would like to review all the answers in the group using the grouping interface, click on the group name underneath “Grading by Group” on the left. To grade a group, simply select the appropriate rubric items and click “Next Ungraded” (or press ‘Z’ on your keyboard). You will be taken to your next group, or to the next ungrouped submission if all groups have been graded. Note that the progress bar will change to reflect the number of individual submissions that were just graded. If you would like to find and grade a specific student’s submission in the group, click on the Submissions link next to the group name. Clicking on a submission from that table will take you to the regular grading page, where you can grade each submission individually, rather than as part of a group. If you want to jump back to grading by group, just click Grade the whole group instead in the upper left section of the page. Note that if you formed groups, submissions are presented for grading in group order, largest group first, and sorted by time of submission within a group. If your student submits a regrade request, you have the option of applying the regrade to just that individual student (the default), or to the entire group that the student’s submission was a part of. If you would instead like to apply the regrade to the entire group of submissions, simply open the regrade request and then click Grade the whole group instead at the top of the page. Your changes apply to all submissions in that group, except for submissions that were graded individually. AI-assisted Grading lets you grade fixed-template assignments even faster by grading groups of similar answers at once. You will review suggested groups - or form your own - using our grouping interface. Then, you will grade the resulting groups, using the same interface you would use to grade individual responses. While we try to make your experience with AI-assisted Grading as smooth as possible, there are a few things that we recommend you do to help make your suggested answer groups the best they can be. Upload an entirely blank assignment template. Please do not use a filled answer key as your template. The template is used as a negative to extract student ink from their submissions. Make sure your template is identical to the one you distribute to students. If you upload a version of the assignment that is different than what you distributed to your students, we will not be able to parse what your students wrote. If you find suggested answer groups that are completely unhelpful, it is likely that your template differs from the student submissions. Leave some space between your questions, so that the region boxes on your outline don’t overlap. If student handwriting from the previous question makes its way to the answer region for the following question, this may throw off groups. Try to use just one answer area per question. Increasing the number of answer areas (lines or boxes where students write their answers) can result in many permutations of answer groups. This makes reviewing these groups more difficult. It is usually better to separate complex questions out into subquestions on the outline instead. We support multiple choice questions where students fill in bubbles or check squares. We do not currently support questions of circle-the-right-choice variety. There must be clear mark regions, and they must be clearly selected by the student (no half-filled bubbles). Pen marks are easier to parse than pencil marks, because they are usually darker. After answer groups have been processed, Gradescope will show you the detected mark regions in blue. If the squares are not properly over the answer areas, you can click Edit Mark Regions to adjust them or to add and remove mark areas. Make sure that each mark area has a blue square over it. If you are making an assignment in LaTeX we recommend following this code example. Gradescope’s AI is able to read student handwriting of English-language text and of math notation (including fractions, integral signs, etc.). The main constraint is for the student answer to be on just one line, which is most easily enforced by providing a clear box or underscored area in the assignment template, as in the two examples below. If you want to specify the exact part of your question that you want to group by, you can set a final answer area by clicking Final Answer Area when you are setting up answer groups or at the top of your answer groups. Note that currently, you can indicate multiple final answer areas for fill-in-the-blank text questions but only one final answer area for math questions. To begin grading, go to the Grade Submissions tab and click on the question that you would like to grade. There are three core components to the grading page. They are the student submission area, the rubric, and the bottom action bar. Grading a submission is as simple as clicking on a rubric item (the box with a number in it) or pressing the number on your keyboard corresponding to the rubric item. At least one rubric item must be applied for a question submission to be considered as graded. To move to another submission, click Next Ungraded to be taken to another student’s submission for the same question. Moving to the Next Ungraded submission avoids more than one person grading the same submission at the same time. The rubric allows you to grade quickly and consistently, applying the same set of feedback to every submission. When you grade with Gradescope, you can change the rubric at any time. This means if you took off too many points or gave too many points for a particular rubric item, you can change it and Gradescope will automatically apply those changes to the other students who received the same mark. You can rearrange the order of your rubric items at any time by clicking and dragging them, and you can select as many rubric items as you’d like for each submission. Use Shift + Enter to start a new line in your rubric item description. You can also collapse the rubric view to see more rubric items on the screen by clicking Collapse View. By clicking on Rubric Settings, you will see that we support two different styles of grading. Positive Scoring means that rubric items default to adding points, starting from 0. On the other hand, with Negative Scoring (the default mode), rubric items default to subtracting points from the total points available for that question. If you want to have a rubric item that has the opposite effect of the default scoring style, you can change the sign before the point value from a minus (-) to a plus (+) or vice versa. There are also options for a point ceiling to prevent scores greater than 100% and a point floor to prevent scores less than 0%. These are both enabled by default so that you don’t get scores out of the expected range, but you can disable them for extra credit questions or other situations where you don’t want the default behavior. You can set assignment-wide defaults for the scoring scheme and score bounds from the Settings page in the left sidebar. Clicking on Import… will allow you to import rubric items and rubric settings from another question. On Gradescope Basic courses, importing is restricted to courses within the same term. With an institutional site license or on a Gradescope Complete course, you can import rubrics from any course in any term. Rubric items are consistent for each question, which means that you can apply them to any number of submissions. However, sometimes you want to give local, individual feedback. You can do this with Submission Specific Adjustments which allow you to add or subtract points as well as provide specific comments to the submission. To create a line or paragraph break in your comment, use Shift + Enter. If you would like to see which submissions a specific rubric item has been applied to, you can click on the magnifying glass icon next to the rubric item. The question navigation menu (top left of the rubric) allows you to move to a different question. Click on the question title and a drop down menu of questions will appear, allowing you to jump to another part of the assessment. Once you understand the basics of interacting with Gradescope, you can speed up your workflow by using keyboard shortcuts. To see these in action, check out the video below. You can use LaTeX to add math symbols in rubric items, comments, text annotations, answer group names, and regrade requests and responses. For more details, check out our FAQ. To go to the your last-viewed submission, you can use the back button in your browser. You may also open multiple tabs at once to grade multiple students’ submissions at the same time. You can visit the Question Submissions Index by clicking on the total submission count, located in the lower left corner. You can also access this page using the “a” keyboard shortcut. This page lists all the submissions for the question that you are on. It displays information such as the grader, the score that was given, and whether a submission was graded. If you are looking for a particular student’s submission to a question, this is an easy way to find it. If your roster included a Section column, you can also click on a section number in this view to only show submissions from students in that section. When you hover your mouse over the Submission View, more options appear that let you manipulate the submission. In the top left, you can toggle between the full page view and the question only view. The question only view allows you to change your view to the region that you set up during the Edit Outline step. The Full Page view allows you to see the whole page of the submission. If a student wrote their response on a different page than the location that you expected, you can use the View Next/Previous page arrows to navigate to other pages of the submission. You can also click All Pages (bottom left) to view all the pages of the submission and jump to another page. For variable-length assignments, any pages the student selected for that question will be highlighted. In the top right are annotation tools to allow graders to mark on a student’s submission. Students can see these marks, which can help the student identify what part of the submission you want them to focus on. Text annotations are only available with institutional site licenses and for individual courses subscribed to Gradescope Complete. If you have any questions about getting access in your course, please send us an email. The navigation tool allows you to click and drag to move around the submission. The text tool allows you to type comments directly on the submission. After selecting it, click anywhere on the page to add text anchored to that spot. Or, to quickly add text from the navigation tool, just double-click on the page. The pencil tool allows you to mark freeform on the submission. The box tool allows you to draw boxes by clicking and dragging to create rectangles on top of the submission. The eraser tool allows you to click on any annotation to remove it. There are also few ways to zoom. You can click the plus (+) and minus (-) button in the bottom right while hovering over the submission. If you move the submission around or zoom in/out and want to save this view to be the default view for that question, you can click Save View. NOTE: Saving the submission view only affects your default view of that question and will not affect other graders’ default view. If you wish to change the default view for all graders, edit the question’s region on the Edit Outline page. Lastly, you can rotate the submission by clicking on the rotate button next to the zoom tools in the bottom right corner. Once you are finished grading submissions, the Review Grades page gives you an overview of what was graded and allows you to publish grades, email students, and export evaluations & grades. 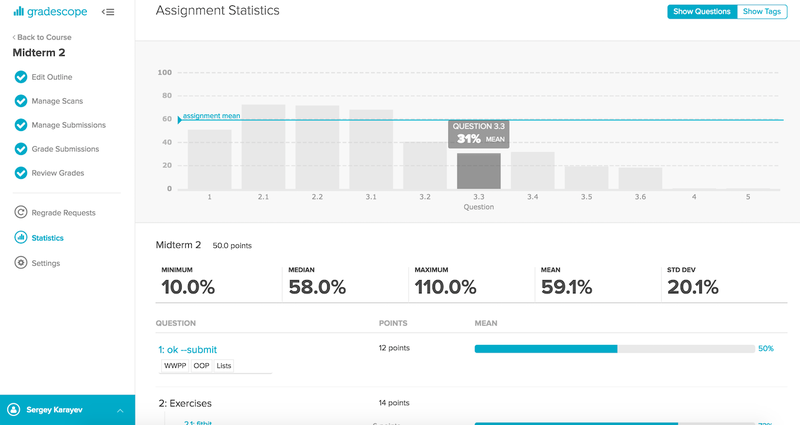 At the top of the page, you can see a histogram and some basic statistics that give you an overview of how your students did on the assignment. The “Time” column in the table below shows you the time when the student submitted to the assignment (for student-uploaded assignments) or when the instructor uploaded the student’s submission (for instructor-uploaded assignments). If your uploaded roster had separate columns for first and last names, you can alphabetize students by last name by using the Swap button at the top of the name column. If you click on a student’s name, you can view that student’s graded exam. This is mostly the same view that the student will see once you publish grades, with the possible exception of hidden rubric items (see the section “Hide rubric items” below). To regrade a question, click on the question name and click Grade in the bottom action bar. If you would like to download the student’s submissions, you can click on Download at the bottom of the page and select whether you would like to download the original or graded submission. If you download the graded submission, the rubric will appear on the first page of the downloaded PDF. In order for students to be able to see their grades via Gradescope, grades must be “Published”. You can do so by clicking Publish Grades. You can check whether or not grades have been published by looking at the top right indicator. It will say “Grades Published” in blue if grades are published, or “Grades Not Published” in grey if they are not. You can also unpublish grades by clicking on Unpublish Grades. Publishing grades does allow students to see their graded work, but simply publishing grades won’t notify students. If you wish to send an email to the students who submitted work, you can notify them by clicking Compose Email to Students and filling out the form. Every time you compose an email, a new email notification will be sent out to all students who have submissions for the assignment. Students with no submission or with partially graded submissions will not be able to view their scores. By default, the email notification contains some basic assignment statistics, but you may choose to remove these if you’d like. Once your grades are published, you can see which students have viewed their grades by looking at the “Viewed?” column on the Review Grades page. If the eye icon is green , the student has viewed his or her exam. Note that students will never be able to see the name of the person who graded their submission. By default, all rubric items are shown to students. We believe this helps students learn from their mistakes and assures them that grading was fair and accurate. Show only applied rubric items. In this mode, students will see only the rubric items which were applied to their submission for negative-scoring style questions. However, for positive-scoring questions, students will still see unapplied items, so that they can understand why they didn’t receive full credit. Note that no matter which option is selected, students will always see submission-specific comments and point adjustments. Also note that, as the instructor, you will always see all rubric items when you view a student’s submission, even if you’ve opted to show students only applied rubric items or to hide rubric items from students. You can see the students’ view of the rubric by exporting submissions (click Export Submissions in the bottom action bar). From the Review Grades page, all data can be downloaded from Gradescope in CSV and Excel formats. Download Grades is a traditional list of Names, Submission Times, Total Scores, and Question Scores. For student-uploaded assignments, you’ll also see a “Lateness” column (in HH:MM:SS format). For students who submit before the due date, “Lateness” will be recorded as 00:00:00 in the spreadsheet. Export Evaluations is a more detailed report of students’ scores for each question, showing which rubric items were applied to each student. Export Submissions lets you download all of your students’ graded assignments in PDF format. The rubric will appear as the first page of the PDF, and any annotations you made directly on the submissions will be visible. This option is useful if you would like to return graded exams in person rather than digitally. (These instructions are for Canvas, but they apply to Blackboard, Brightspace, Sakai, and Moodle as well.) If your school has Canvas integration enabled, you can easily export your grades from Gradescope to Canvas. 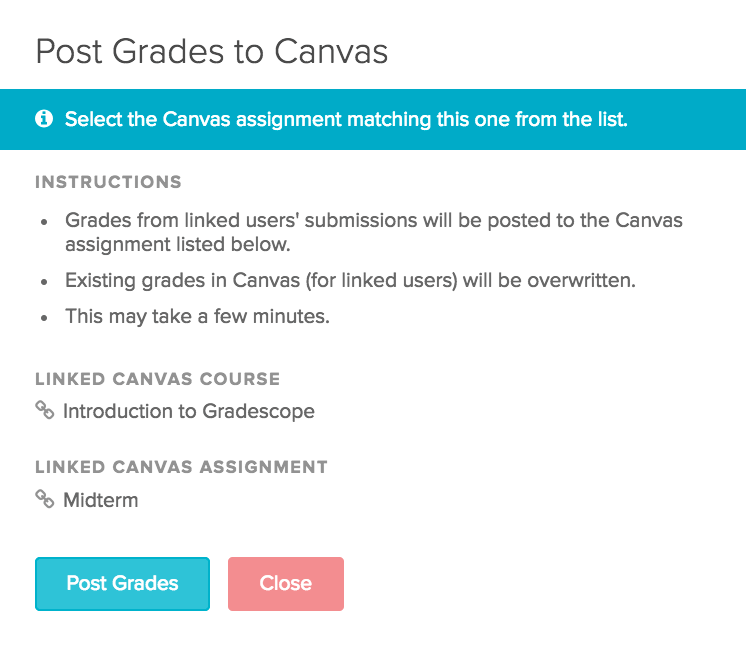 Note that an assignment must be published on Canvas in order to post grades. To export grades to Canvas, click the Post Grades to Canvas button in the bottom action bar. In the dialog, double check that the correct Gradescope course and assignment are linked to the correct Canvas course and assignment. If everything looks good, click Post Grades. Once the export is complete, click Close. Student grades will appear in your Canvas course. Note that only students who have a teal icon in the “Linked” column on the Review Grades page will have their grades sent to Canvas. Nothing will happen with accounts that are not linked. If the icon is gray for any student(s), go to your Roster page and click the Sync Canvas Roster button. If you regrade any question or update any student’s grade, you will need to click the Post Grades to Canvas button again to re-export your grades. Regrade requests allow students to submit short statements about why they think their work should be given another look. Regrade requests are enabled by default for all published assignments. To disable regrade requests, go to the Regrade Requests page in the left sidebar, click Regrade Request Settings, and uncheck the “Regrade requests enabled” box. From this modal, you can also set the start and end date for when regrade requests will be accepted. If you don’t set start and end dates, regrade requests will be accepted for the assignment until you manually disable them. By default, when students submit a regrade request, the grader who last graded the submission will receive an email detailing the request and how to view it. You can change your regrade request email notification preferences from your account settings or from the assignment’s Regrade Requests page. Note that these settings will apply to all courses and assignments on your account. 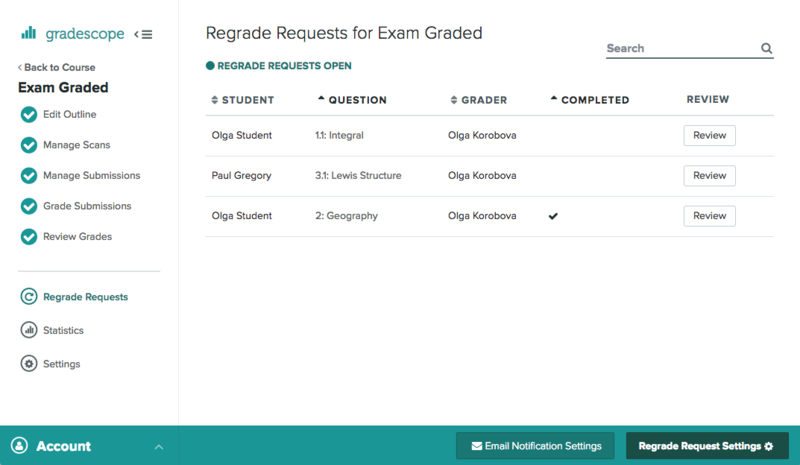 All instructors, TAs, and readers can view all regrade requests under the Regrade Requests page. Clicking Review will take you to the student’s submission, where you can read the student’s request. You can make changes to the grading by clicking other rubric items or by applying point adjustments. You can also modify rubric items which will change how all other students are graded, as it would during the grading process. If you just want to give a specific change to the student, use point adjustments. To close the regrade request, type a reply to the student and click Close & Respond. The student will receive an email detailing your response and can view their adjusted grade on Gradescope. Students also have a page on their accounts where they can see the status of all the regrade requests they’ve submitted for your course. Note that students will never see the name of the instructor or TA who replies to their request. If a student has any further concerns, they can open a new regrade request. Finally, you can view the complete conversation thread about a specific regrade request by viewing the student’s submission (accessible from either the Manage Submissions or Review Grades page) and selecting a question. The submission view will also show an “IR” badge next to any question that has a regrade request pending review and an “R” badge next to any question with a resolved regrade request. The Statistics page allows instructors to gain further insights into what their students have learned. Only students with uploaded submissions will be counted towards the assignment statistics. The default view showcases the averages from each question. Clicking a question’s bar within the chart will focus on it, updating the stats under the chart. You can also tag each question with concepts. By clicking “Show Tags”, you can then switch into Tag View to see the breakdown of points by tag. Delete any tag by clicking on the line next to the tag and clicking backspace/delete on your keyboard. If you click a question in the table below the chart, you can see that question’s statistics, showing you how often each rubric item was applied. This allows you to pinpoint particular difficulties or concepts that students struggled with. NOTE: We would love to hear from you about how we can meet your data analysis needs. If you have feedback, please send us an email. If your instructor gave you the entry code for the course, you will be able to add yourself as a student. To do this, if you already have a Gradescope account, log into that account and navigate to your Account Dashboard by clicking the Gradescope logo in the top left, and click Add Course in the bottom right corner. If you don’t have a Gradescope account yet, go to our homepage, click Sign Up in the upper right corner, select Student, and put in your entry code in the sign-up form. Note that your instructor may choose to disable the entry code and not allow students to use entry codes to enroll. If the entry code doesn’t work, please email your instructor for details on how to access the course. If you don’t have an entry code, your instructor must add you to the course. Once you’re added to a course, you’ll get an email asking you to set your password if this is your first time logging into Gradescope or an email with a link to the course if you already have an existing account. If the set password link in this email expires, you can request a new link from the Reset Password page. NOTE: Sometimes instructors use a different email address than the one on your existing Gradescope account. If you were added to a course, but you don’t see it in your Account Dashboard, check with them to see what email address they used. If you end up with multiple accounts, email us and we can merge them for you. If you were added to a course that you’ve dropped, please email your instructor and ask him or her to remove you from the course roster. If you already have a student account and want to add a course as a TA, Reader, or Instructor, email us. NOTE: We have a PDF version of this section for use as a handout. To turn in homework on Gradescope, you will need to create a PDF of your work and save it to your computer before submitting. There are many scanning apps to create PDFs on iOS. In particular, we recommend the app Scannable by Evernote. You can also follow a similar process with other scanning apps, just make sure the app you choose will let you make high quality PDFs. DOWNLOAD: Get Scannable by Evernote from the App Store. SCAN: Once on the main page, Scannable will start looking for a document and automatically start scanning. SELECT & SEND SCAN: When you’re done, select the check mark. You can now review your scans, tap Send Scan, select the correct pages, and Mail your scans to yourself. From here, save your file onto your computer in a memorable place, and you’re ready to submit! 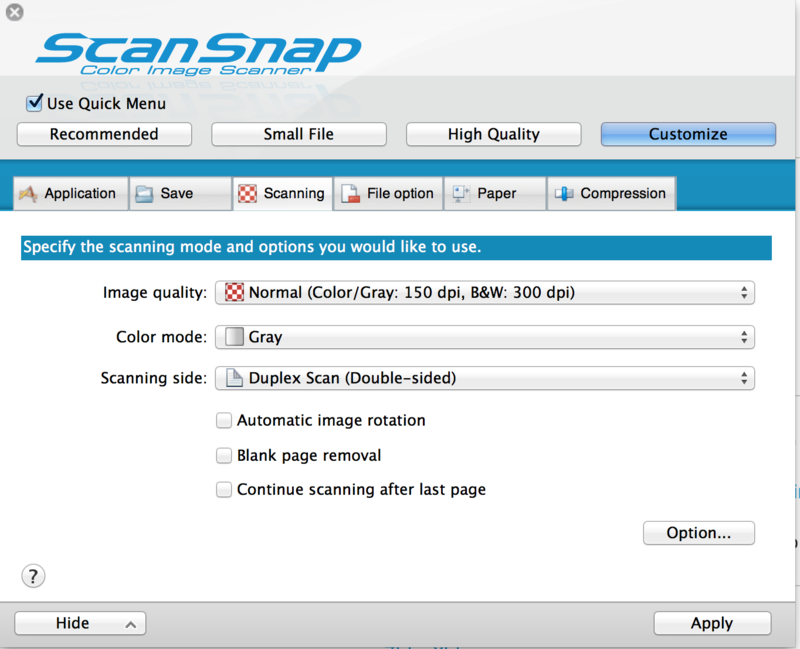 TIP: When setting up Scannable, it’s a good idea to click … > Settings > File Type > PDF. This way, your single page assignments save as PDFs. Similar to iOS, Android has many apps to create PDFs. We recommend Genius Scan. You can also follow a similar process with other scanning apps, just make sure the app you choose will let you make high quality PDFs. DOWNLOAD: Get Genius Scan from the Play Store. SCAN: Once you open the app and get to the main page, select the camera, snap your photo, and crop it to your liking. Continue to do this for all pages of your submission. CHECK/FINISH SCAN: When you’re done, select Move To > Create / Add to a new doc. SHARE SCAN: The last step is to get your scan onto your computer so you can submit via the web. Select your document, click the Share icon and send the PDF to your email. TIP: As you take your photos, you can save your scans to a document by selecting Move To. Whether you do it before or after scanning, make sure that the pages of a multi-page homework are all in one document and not in individual scans. Taking your photos: Place your work on a flat surface. (A darker table with high contrast to your paper is best). Hold your camera directly above the paper with a steady hand, parallel to the table. Always check that your photos are clear—if you try to speed through you will get blurry photos! If your scan is still illegible: You might have written your assignment too lightly or unclearly. Make sure you use a dark pen or pencil! 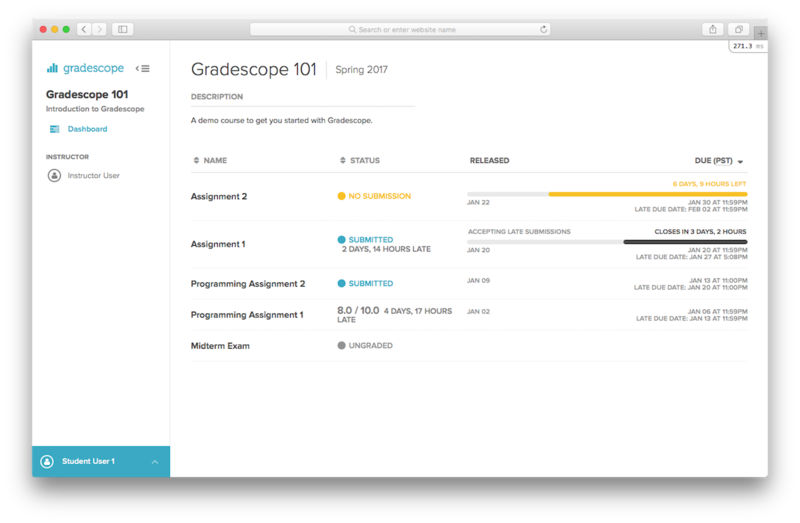 Assignments you’re able to submit on Gradescope will appear on the course dashboard. You will be able to see the status of the assignment, the release date and the due date. If your instructor has enabled late submissions for the assignment, you’ll also see a late due date. Most student-submitted assignments will be of variable length, meaning that answers will not always be located in the same place, and can span across any length of pages. If you choose to submit individual images, you will be taken to a list of questions for your assignment. Click on Select images for the first question and choose the images that correspond to the question. Repeat this until you have submitted images for all the questions in the assignment. Once you have finished adding images to all questions click on Submit Assignment to complete the assignment submission. If you choose to submit a PDF, you will be prompted to upload your file. Once submitted, you will be asked to mark which pages of your PDF correspond to questions of the assignment. For each question, mark the pages containing the answer by first clicking on a question on the left and then clicking on the corresponding page(s) on the right. For example, if you wrote the answer to question 1 on the first two pages of your submission, you would click on question 1 on the left and then click on the first two page thumbnails on the right. If your response to the second question is on the second and third pages of the PDF, select question 2 on the left and then mark the second and third page thumbnails on the right. Continue to do this until all questions have their corresponding pages marked. You can use the Shift key to select multiple questions. Hover over any page thumbnail to zoom in on it or rotate it, and click and drag pages to reorder them. When you’re done, click Submit. See the video in the beginning of this section for an example of how to properly mark your PDF. 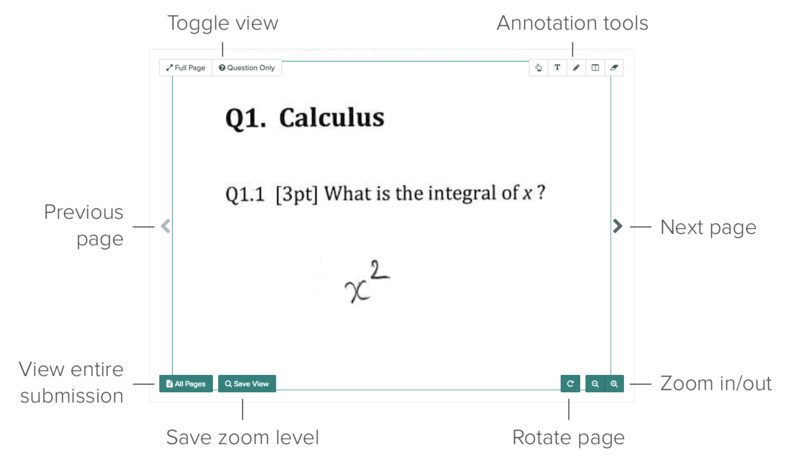 NOTE: If you create a PDF where each question is on its own page, you can quickly assign these pages by using the Assign Pages Sequentially button in the bottom action bar. In some cases, your instructor may assign worksheet-style homework, where your responses are fixed to particular locations. Because your instructor already knows where your responses will be, you only need to upload your completed PDF and will not be asked to assign pages. If your instructor has enabled late submissions for the assignment, you may upload a submission after the deadline (but before the late deadline). Note that late submissions may be subject to penalties, as determined by your instructor. If you were not able to submit an assignment before the late submissions deadline, or if late submissions are not enabled for your assignment, please contact your TA or instructor. They can manually upload a submission for you after the deadline if they wish to allow it. The Gradescope team cannot make course policy decisions on their behalf. 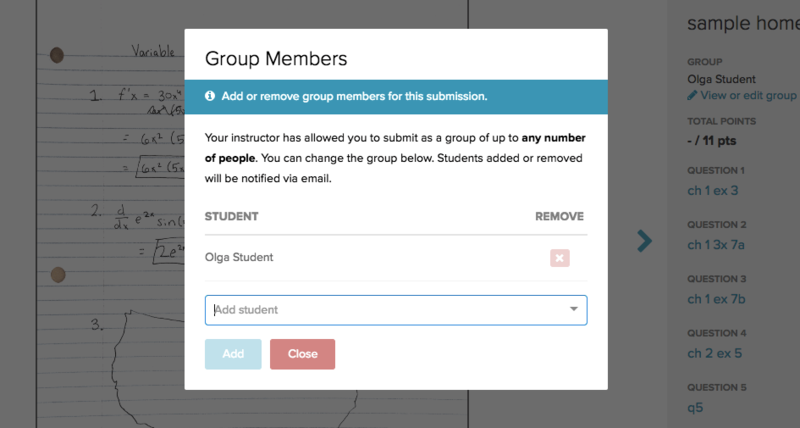 If your instructor has allowed it, you can add group members to your submission. You can add members either by clicking on Group Members in the action bar or by clicking View or Edit Group in the outline area of the submission. You can edit your group via the same dialog. Whenever a user gets added or removed from a group, they will receive a notification email. To view your assignment submission, click on an assignment from the course dashboard. If you have already submitted the assignment, you will be able to view your submission. You can resubmit from this page any number of times until the submission deadline by clicking the Resubmit button on the bottom action bar. For variable-length assignments, you may also reselect the pages at any time (even after the deadline has passed). Until your course staff have finished grading, you will see this ungraded version of this page. Once your instructor publishes grades, the status changes from “Ungraded” to “Graded”, and you will be able to see the total score as well as the scores for each question. You’ll also be able to download your graded submission by clicking Download Graded Copy. Your instructor may choose to email you when grades are ready. Once your assignment is graded, you will see all grading rubrics, and rubric items applied to your submission will be highlighted. Click on a question name to view the rubric items for that question and any comments from your instructor. Viewing the rubric is a great way to get feedback about your work, and helps ensure that it was graded fairly. Note that in some cases, instructors may choose to hide some rubric items. If no rubric items are shown, there will be a message letting you know. However, any comments and point adjustments specific to your submission (that don’t use a rubric) will always be shown. If your instructor allows it, you will also be able to submit regrade requests by selecting a question and then clicking Request Regrade from the bottom action bar. For more information, see our help item on regrade requests. Click Download Submission to get a PDF containing your submission and detailed rubric markup. If your instructor has allowed it, you can submit Regrade Requests for questions you feel were graded incorrectly. When you view your submission, if you see a Request Regrade button in the bottom action bar, regrade requests are enabled. To submit a Regrade Request, first click on the question that you wish to submit a request for. This will display the rubric for that question and highlight the rubric items that were applied. Once a question has been selected, click the Request Regrade button in the bottom action bar. A textbox will appear allowing you to type an explanation of the request for the specific question that was chosen. Tip: Instructors are most likely to respond to regrade requests when they are polite and concise. NOTE: Regrade requests are per question, so if you have multiple requests, make sure to submit one for each question that should be reviewed. Once a request has been sent, your instructor(s) and the grader(s) who graded the question will receive an email notifying them of the request. The grader(s) can then optionally re-grade the question, reply with a response, and close the request. Upon closing the request, you will receive an email notifying you the request has been resolved. You can view all pending and completed regrade requests for a course from the Regrade Requests page (in the left sidebar). Regrade requests that have been addressed by the instructor will be marked as “Completed”, and you’ll be able to see your updated score for that question. You can also check the status of your regrade request when you view your submission. If the badge next to the question says IR, your regrade request is in review. If the badge says R, the regrade request has been resolved. After the regrade request is resolved, you can make another request by selecting the question and clicking the Request Regrade button again. You can see the complete conversation thread for a specific request by clicking on a question when you view your graded submission. If you have forgotten your password or are otherwise unable to log in, please visit the password reset page and enter the email address you are registered with. This will allow you to set a new password and log in. If you are a student, your instructor should have added you to Gradescope. If you can’t remember what email address your account is under, try your university email first. Your course staff can also check the roster in Gradescope for you, so you can ask them to look it up. How can I edit my account? To edit your account, click on Account in the lower left corner of the dashboard and select “Edit Account” from the menu. From this page, you can update your full name, email, password, and regrade request email notification settings. You can also link or unlink external accounts to Gradescope, such as a Google account. How can I merge two accounts? Occasionally, users will end up with two accounts with courses split across them. Currently, there is no way to merge accounts via the Gradescope interface. Contact us and we can do this for you. Is Gradescope a good fit for my course? 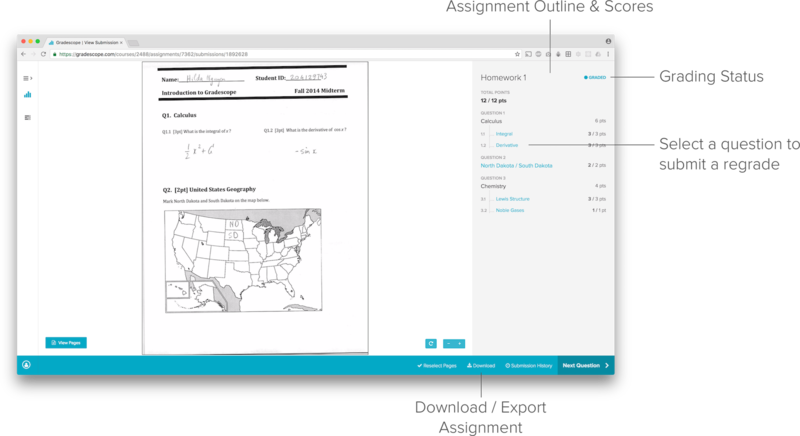 Gradescope works well for a wide variety of answer types: paragraphs, proofs, diagrams, fill-in-the-blanks, multiple choice, and more. Our biggest users so far have been high school and higher-ed courses in Math, Chemistry, Computer Science, Physics, Economics, and Business — but we’re confident that our tool is useful to most subject areas and grade levels. Please reach out to us and we can help you figure out if Gradescope will be helpful in your course. Can multiple people grade at once? 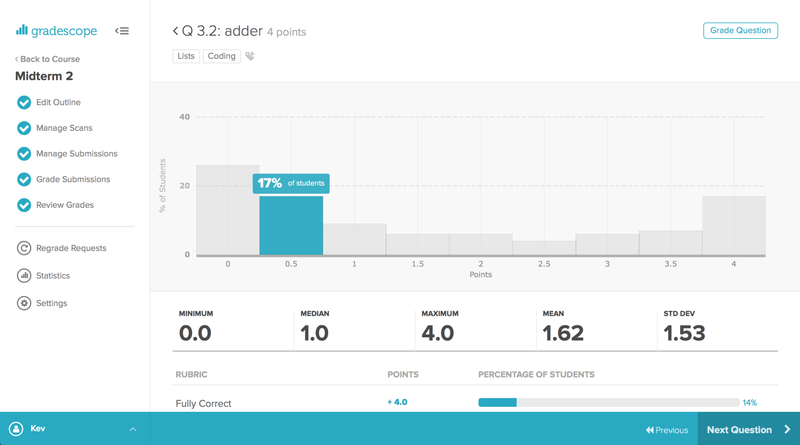 Yes, Gradescope is built to allow multiple graders to grade at once. 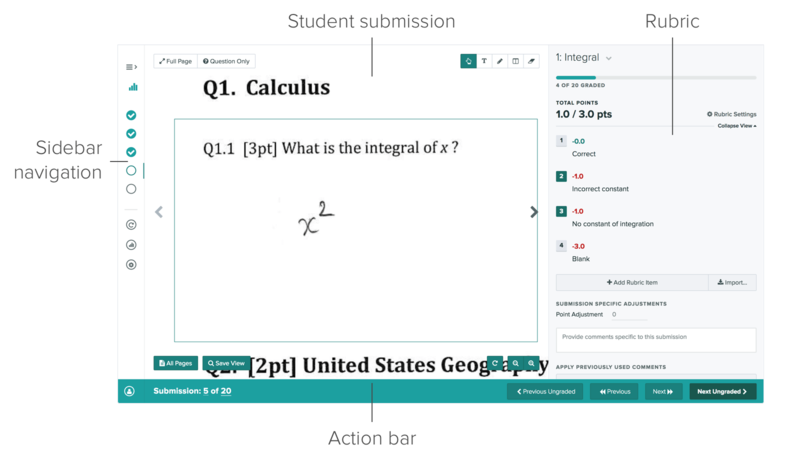 The easiest way is to have each person grading their own question, but multiple people can also grade the same question without a problem, as long as they use the Next Ungraded button to navigate. This will ensure that graders never see something that someone else is looking at or has already graded. How do I digitize student work? Students upload work themselves, usually using a smartphone to take pictures of their work. You scan in student work yourself, by ‘batch’ scanning in many exams at once. See Managing Scans for more information. For best scanning practices check out our video below! Won't scanning take a long time? Most instructors find that even with scanning, Gradescope saves them 30-60% time compared to grading on paper. Once you’ve done the scanning process once, the subsequent scans will go much more quickly. In addition to grading being much faster, you don’t have to spend time in class returning work, or time in office hours on regrade requests. With scanning you also avoid students cheating by changing their answers after they get their work back. What scanners do you recommend? Before you buy a scanner, you should check whether or not your school already has a scanner, or a networked photocopier. Many newer copiers have high quality, scan-to-email functions that are worth testing. However, standalone scanners sometimes provide better results, and are easier to share between courses. There are roughly three price points of scanners well-suited for Gradescope: about $400, about $800, and $1600 and up. For the $400 price point, we recommend the ScanSnap ix500 (this is an Amazon affiliate link). Check out our recommended settings. For the $800 price point, we recommend the Canon DR-M160II. It’s about 2.5x faster than the ScanSnap, and has a larger capacity, meaning that you can scan more students’ work at a time with it. We don’t have a recommendation for the highest price point. If you’ve had good experiences with an expensive scanner, let us know! Do you integrate with my school LMS? If your LMS is not supported, or you do not have an institutional license, integration is currently manual: you can import your course roster as a CSV file to Gradescope and download Course or Assignment grades as spreadsheets for upload to the LMS. Interested in closer integration with your school’s LMS? Let us know! How do I login using my school's credentials? If your school has an institutional license, you may be able to log in to Gradescope using your school’s single sign on (SSO) system. Here’s our list of supported schools. When your school has an SSO integration, you will be able to use either a Gradescope account and password or your school’s credentials. If you have never logged in to Gradescope before, a Gradescope account will automatically be created for you when you first log in with your school’s credentials. The email address on your account will be the same as the email address associated with your school’s credentials. If you already have an existing Gradescope account, if your Gradescope email address matches the email address associated with your school’s credentials, then your account will be automatically linked when you attempt to log in to Gradescope with those credentials. If your Gradescope account has a different email address, we recommend that you first log into Gradescope, and then link your school credentials by visiting your account settings page. Otherwise, you may end up with two separate Gradescope accounts. If that happens, please email us, and we can merge them for you. When importing your roster, you should try to use the same email addresses that your school uses for students. When students’ emails match, we can automatically link their accounts for them when they try to log in with school credentials. Otherwise, they will have to link their account first or email us to have their accounts merged. Interested in integrating with your school’s SSO system? Contact our sales team! Do I have to upload student emails? We use students’ email addresses to make accounts that they can log in to. Once logged in, they can submit work, view their graded work, and request regrades of their graded work. If you want to use Gradescope for grading only, without your students ever logging in, you can upload fake email addresses (e.g. ending with @example.edu), upload their submissions yourself, and then export grades as a spreadsheet. How does Gradescope handle late assignment submissions? If you choose not to allow late submissions, students will only see the due date. Instructors and TAs are able to upload submissions on behalf of students after the deadline from the Manage Submissions page by clicking “Upload submission” in the bottom action bar. Can I use LaTeX on Gradescope? Yes, you can use LaTeX to include math symbols in rubric items, comments, text annotations, answer group names, and regrade requests and responses. th expressions inline with text. Display (Paragraph) mode - Put $$$ delimiters around your LaTeX markup. Your math expressions will appear larger and in a separate paragraph. Note that, for the student-specific comment box, LaTeX does not currently render on the grading page. However, your students will be able to see the properly rendered notation when they view the comment. To double check that your LaTeX comment was rendered correctly, you can go to the Review Grades page and click on the student’s name to see their view of the submission. Questions about how to use LaTeX on Gradescope? Let us know! Is there a blurb about Gradescope that I can share on my syllabus? We will be using Gradescope this term, which allows us to provide fast and accurate feedback on your work. Homework will be submitted through Gradescope, and homework and exam grades will be returned through Gradescope. As soon as grades are posted, you will be notified immediately so that you can log in and see your feedback. You may also submit regrade requests if you feel we have made a mistake. Your Gradescope login is your university email, and your password can be changed here. The same link can be used if you need to set your password for the first time. What does Gradescope do with my data? Below, we list the relevant requirements from FERPA and explain how Gradescope meets these requirements. Performs an institutional service or function for which the agency or institution would otherwise use employees. Gradescope aids you in grading and understanding student work, which is a function of the institution's employees. Is under the direct control of the agency or institution with respect to the use and maintenance of education records. We only use educational records to perform and improve the service. We will delete student records upon request. Is subject to requirements governing the use and redisclosure of personally identifiable information from education records. We do not redisclose personally identifiable information, except as directed by the institution or student. Just getting started? Check out our Guide!